The GS1 DataBar barcode symbology is the latest POS barcode type from GS1. DataBar barcodes may be utilized to solve many problems in POS, grocery and healthcare, where items are too small to allow for traditional barcode types, or where additional information needs to be encoded such as product weight, expiration dates or serial numbers. DataBar is also the only barcode symbology approved by GS1 to encode GTIN-14 numbers in all retail checkout systems and is required by the Joint Industry Coupon Committee (JICC) to be used for DataBar Coupon Barcodes. Ability to encode the entire 14 digit GTIN, eliminating the need to use UPC and EAN symbols. The standard DataBar symbol is smaller in size than UPC-A symbols. Maximize revenue, lower food waste and provide discounts to customers purchasing food that is near expiration. 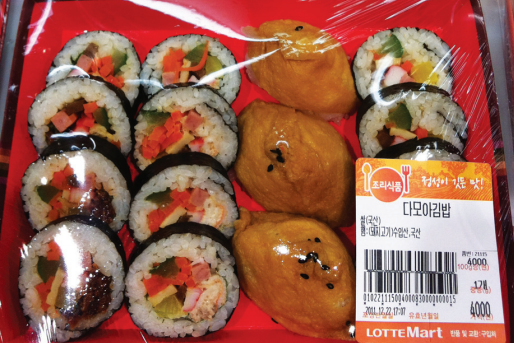 Currently being used in Finland with Froodly and LOTTE Mart grocery stores in Korea. Also refer to the Inventory Management Executive Summary by Planet Retail. Traceability and product recall capabilities. Identification of vendor for fresh produce. Better sell by and expiration date management. Quicker scanning than UPC and EAN symbols. Less chance of scan errors than UPC and EAN symbols because of the advanced modulus 79 or greater internal check digit. UPC and EAN symbols use only a mod 10 check digit. POS systems have been required to read DataBar symbols since 2010. Switching gradually to DataBar now is good preparation for when it will be required. The following is a comparison of a UPC-A barcode encoding the GTIN-12 data “123456789012” with DataBar barcodes encoding the same data for use in POS systems. The GTIN-12 is converted to GTIN-14 by adding zeros to the beginning of the number. The DataBar Expanded Stacked barcode below encodes the 14-digit GTIN and “Sell by Date” in about the same space as a standard UPC symbol. DataBar Expanded Stacked symbols may also be printed at smaller X dimensions than UPC and EAN symbols and sized with the segments property. The above GTIN barcodes were created at 96 DPI with the Barcode Image Generator. DataBar Omnidirectional and DataBar Stacked Omnidirectional symbols are approved for POS use and encode only the GTIN. In all IDAutomation products, the DataToEncode for this barcode type is 14 digits of the GTIN. The last digit in the DataToEncode is the check digit. If unknown, enter 0 for the check digit. If 14 digits are not entered, zeros will be added to the beginning of the data. For example, 77012345678900 will scan as (01)77012345678907. There is an implied AI of 01 that should not be part of the DataToEncode, except when using DataBar Expanded. DataBar Expanded and DataBar Expanded Stacked are capable of encoding the 14-digit GTIN, and additional data such as expiration dates, country of origin and serial numbers up to 74 numeric or 41 alphabetic characters. Omnidirectional is not normally part of the title of this symbology, even though it is omnidirectional. In all IDAutomation products, the DataToEncode for this barcode type prefers parentheses around each AI in the barcode, however, it is not usually necessary. There is an implied FNC1 included in the beginning of the data encoded because this symbol is designed to be used only for GS1 applications. The AI combined with its data make up an Element String. Multiple defined length Element Strings may be encoded without any added delimiters or FNC1 codes. If only one variable length Element String is used and included that at the end of the encoded data, a delimiter or FNC1 is not necessary. However, if it is necessary to encode two or more variable length Element Strings, such as (10) and (21), the ASCII 202 character (Ê) must be inserted as a delimiter after the data of a variable Element String that is not encoded last. For example: (01)34567890123457(10)3456789Ê(21)3456789012. DataBar Expanded symbols are transformed into DataBar Expanded Stacked symbols by changing the segments property to a low even number such as 4, 6 or 8. Table 2. DataBar Expanded Barcodes may be sized with the segments property to change the height or width of the symbol. The above DataBar barcodes were created at 96 DPI with the DataBar Barcode Image Generator. DataBar Truncated, DataBar Stacked and DataBar Limited symbols are not omnidirectional and are not approved for POS use. It is rare to see these barcode types in use because they are not approved for POS and they do not offer any additional functionality over the POS approved symbologies except that they are smaller in size. If size is a concern, it is usually better to use GS1-DataMatrix or GS1-QRCode instead of DataBar because these symbologies will be standard in the future according to GS1 and they can encoded much more information than the GTIN. In all IDAutomation products, the DataToEncode for this barcode type is 14 digits of the GTIN. The last digit in the DataToEncode is the check digit. If unknown, enter 0 for the check digit. If 14 digits are not entered, zeros will be added to the beginning of the data. For example, 77012345678900 will scan as (01)77012345678907. There is an implied AI of 01 that should not be part of the DataToEncode. DataBar Barcode Fonts allow creation of all DataBar and Expanded barcodes from a single font. ASP Barcode Server for IIS enables IIS to generate DataBar barcodes. ASPX Barcode Generator easily generate barcodes on websites with ASPX script processing enabled. Barcode Image Generator is a stand-alone application that creates barcode image files for PhotoShop, Quark, CorelDraw and others for printing or display and is compatible with DataBar Coupon barcode specifications. Barcode Label Design Software Pro is used to design and print barcode labels from data that is incremented, or retrieved directly from a database. .NET Windows Forms Barcode Controls create and print barcodes from Microsoft Visual Studio.NET applications. Java Barcode Packages generate barcodes on any java compatible system. SSRS Barcode Generator for Microsoft SSRS Report Builder and Report Designer. IDAutomation USB Barcode Scanner with DataBar offers superior performance at an affordable price, and reads GS1 DataBar-14, DataBar Limited, DataBar Expanded, DataBar Expanded Stacked, DataBar Truncated, UPC, EAN and other common barcodes. IDAutomation 2D Barcode Scanner has omni-directional reading of DataBar.